From the delights of Woodstown in Waterford and wasp waisted women to ancient artifacts and abodes in Sligo! 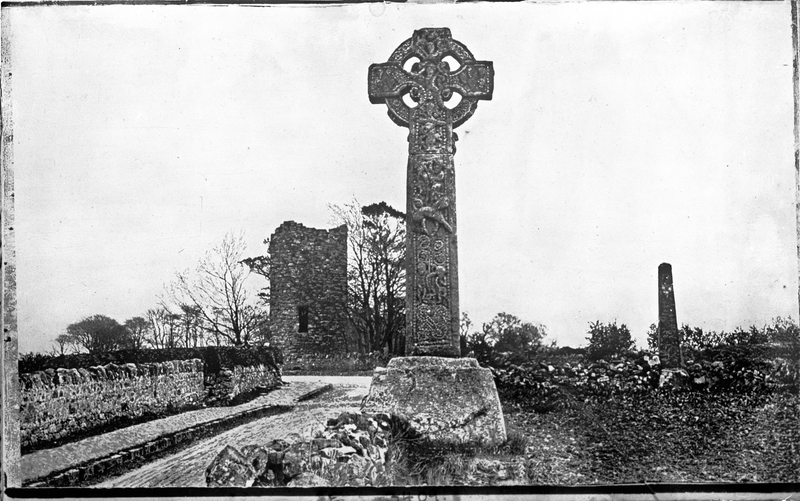 This fine celtic cross appears to have been beautifully decorated, and is positioned with a tower in the background. Some great vertical lines in the shot. Is it still standing and in that location? Drumcliffe? goo.gl/maps/h58SKYgmjYn FISA - www.flickr.com/photos/annaprescott/2274099124/ Image is reversed. Is that a monkey half way up? Definitely Drumcliffe, as children we were told that when the wisest man in Ireland passed under the tower it would fall on him! Thanks very much all - Especially [https://www.flickr.com/photos/beachcomberaustralia] and[https://www.flickr.com/photos/[email protected]] for the near concurrent location identification notes :) While I have not flipped the image, I have made a note of the probable mirroring - as well as a few other notes from today's investigations. 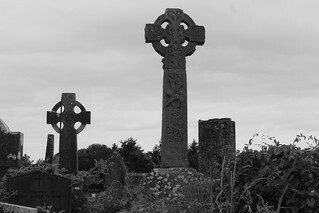 (Including my own discovery, not previously known to me, that Yeats is buried in this same graveyard).